Visiting Fellow, Department of Computer Science, The Australian National University and Director of Professional Development for the Australian Computer Society. For the China Media Centre Conference, Brisbane, 2:30pm, 6 July 2007. This is one of two talks for the 2007 China Media Centre Conference in Brisbane, 5 to 6 July 2007. This one is Friday, 6 July: Globalisation, Ideology and Theory, with Lian Zhu (University of Bournemouth, UK), Terry Flew (Queensland University of Technology), Xin Xin (University of Westminster). The other forum is Thursday on Re-Imagining Global Media, with Terry Flew, John Hartley and Michael Keane from Queensland University of Technology, Anne-Marie Brady (University of Canterbury, NZ), Jack Qiu (Chinese University Hong Kong). I am talking on "Inventing a New Media for China Beyond the Olympics". Balancing the competing demands for the 2008 Olympic web site are as delicate as that of any gymnast. China needs to meet the requirements set down by the International Olympic Committee, the needs of internal readers, and the international media. The Sydney games made tentative steps towards a web based Olympic experience, which Athens retreated from. Beijing 2008 will be the first games of the new Web 2.0 era. How are issues such as control of content handled, what role will mobile phone based content have? Tom Worthington will discuss the issues from the point of view of someone involved with the early planning. He was an expert witness in the Australian Human Rights and Equality Commission on a case involving the Sydney 2000 Olympics web site design. He was invited to Beijing help in planning for the Beijing Olympic web site, with Chinese and International Olympic officials. 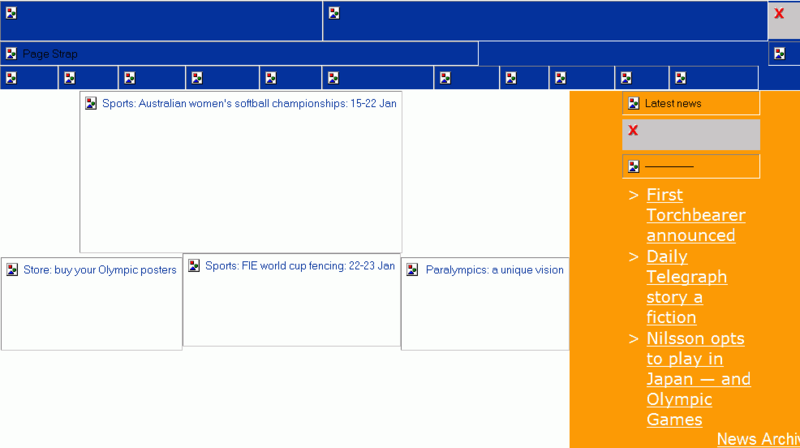 Balancing the competing demands for the 2008 Olympic web site are as delicate as that of any gymnast. China needs to meet the requirements set down by the International Olympic Committee (IOC), the needs of internal readers, and the international media. The rights to host the Olympic Games are awarded to a city by the IOC. Generally the national state and local government of the city will be closely involved. The web designers therefore need to satisfy the requirements all these sponsors (which may conflict). In addition the web designer needs to meet the requirements of local readers, international readers and the media. The IOC places requirements on Olympic hosts to provide information in an internationally accessible format. As an example, information must be provided in: English, French and the local language. The detail of the requirements can cause some difficulties. The particular form of English required for the Olympics is British English. This may cause confusion for those educated in US English. Sydney 2000 was the first games with a fully mature web site. The web was used for promotion and ticket sales. The next games in Athens 2004, did not expand on this. Beijing 2008 will be the first games of the Web 2.0 era with a greatly expanded local and international population expecting an interactive web experience and used to digital video online. However, TV rights for the games are awarded separately by the IOC. As a result the amount of digital video the host nation can place on their web site is severely limited. The Beijing Olympic Committee (BOCOG) held a 3-day conference with 20 speakers on the implementation of the Beijing Olympic 2008 Official Website. Speakers discussed design, new media applications, web management, marketing and promotion. Staff from previous Olympics and the International Olympic Committee (IOC) attended, along with local and international experts. Control of content, and the role of mobile phones were discussed. The People's Daily newspaper, an official Government newspaper will provide the editorial oversight for the content on the BOCOG site. People's Daily have experience of running discussion forums and web video broadcasting as well as providing online newspapers ton hundreds of millions of readers in several languages (including English). The People's Daily newspaper previously had a hand held (mobile phone) version. This seems to have been discontinued, but the standard web page is reasonably compatible with handheld devices, as is demonstrated by accessing it via the Google Mobile XHTML service. As is usual for an Olympic games web site, Beijing has been through several iterations. These have included the bid site, preliminary site, and revised site. For previous games the Paralympics, held in conjunction with the Olympics, had their own separate web site. But the Beijing 2008 Paralympic Games have been incorporated into the main Olympic web site.BOCOG have released the Beijing 2008 Paralympic Games pictograms. Web accessibility guidelines have been developed to assist designers to make web sites which are available to the greatest range of users of the Internet. The most respected guidelines are those from the World Wide Web Consortium. The W3C Guidelines are divided into three priority levels: 1, 2 and 3, each with checkpoints. There are three levels of conformance corresponding to the three priority levels. It should be noted that as well as disabled users, the authors of the W3C Guidelines also envisaged other users, such as those with electronic kiosks, wireless, mobile and low bandwidth users, second language users. The new official home page for the 2008 Olympics was submitted to TAW (Web Accessibility Test) tool. TAW was developed by CTIC Foundation (Center for the Development of Information and Communication Technologies), a non-profit group of IT firms and government from the Spanish region of Asturias. The tool tests against the Web Content Accessibility Guidelines 1.0 (WCAG 1.0). The BOCOG page failed the test with 7 Priority 1 problems. This is despite the BOCOG's equivalent SOCOG having been taken to court over deficiencies in the 2000 web site and this being detailed at the 2003 BOCOG web symposium. Beijing has been sensitive to disabled issues in other ways, for example installing a tactile path for the blind on the footpath outside BOCOG Headquarters. However, like Sydney, the Beijing Olympics have not made an accessible web site for the disabled a priority. As well as those who are blind, those using smart phones and using language translation, will have difficulty with the web site. In contrast, the London 2012 Olympics web site, which is at an early stage, passed an automated Priority 1 tests. 1. A declaration that the respondent has engaged in conduct that is unlawful under section 24 of the DDA in that it has provided for the use of the complainant a web site which because of his blindness is to a significant extent inaccessible. On 7 June 1999 a complaint was made to the Australian Human Rights and Equal Opportunity Commission (HREOC), of unlawful discrimination by the Sydney Organising Committee for the Olympic Games ("SOCOG"). Part of the complaint alleged a failure to provide a web site which was accessible to the complainant, who was blind. A decision was delivered 24 August 2000 (HREOC 2000), with SOCOG found to have engaged in unlawful conduct by providing a web site which was to a significant extent inaccessible to the blind. The web site ordered to be made accessible by the start of the Sydney Olympics. On 6 November 2000 (after the Sydney Olympics) the web site was found to only be partly complaint and $20,000 damages were awarded (HREOC 2000c). This is the SOCOG web site as it appeared to those who could see the graphics. Implement W3C WAI Level-A Compliance: Web site designers should aim to implement priority 1 and 2 checkpoints of the W3C guidelines, but should be required to at the very least achieve implement priority 1 (Level-A compliance). This will require minimal effort by competent designers. Use Pictograms: References to sports should use the IOC's standard pictograms, as well as text descriptions. Text in images should be avoided as this makes translation into other languages difficult (requiring a version of the image for each language and preventing automatic translation). Allow for machine language translation: In addition to maintaining the versions required in the official Olympic languages, the web site should be designed to be able to be translated into other languages automatically. Use of accessibility guidelines, pictograms and avoiding text in images should make this feasible with minimal additional effort. Integrate Kiosk, wireless and Web site content: One set of content should be designed for the public web site, wireless device users and for use on touch sensitive kiosks at Olympic venues. This will avoid additional effort being needed to maintain multiple versions of the same content. Graphics should be designed to be usable at the range of resolutions required and on text-only screens.